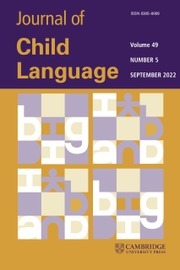 A key publication in the field, Journal of Child Language publishes articles on all aspects of the scientific study of language behaviour in children, the principles which underlie it, and the theories which may account for it. 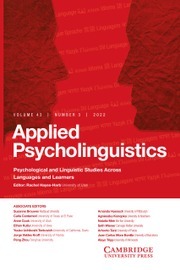 The international range of authors and breadth of coverage allow the journal to forge links between many different areas of research including psychology, linguistics, cognitive science and anthropology. 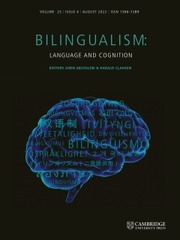 This interdisciplinary approach spans a wide range of interests: phonology, phonetics, morphology, syntax, vocabulary, semantics, pragmatics, sociolinguistics, and any other recognised facet of language study. Aspects of reading development are considered when there is a clear language component. The journal normally publishes full-length empirical studies or General Articles as well as shorter Brief Research Reports. To be appropriate for this journal, articles should include some quantitative data analyses, and articles based on case studies need to have a convincing rationale for this design. 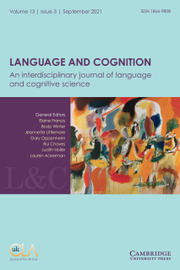 The journal publishes thematic special issues on occasion, the topic and format of which are determined by the editorial team.